I’ve been in Israel for nearly three weeks now and still every time someone speaks to me in Hebrew I’m like a deer in headlights. I stare at them looking like a helpless child who might burst into tears at any moment. Only recently have I been able to at least blurt out “Anee lo madaber Ivreet” – I don’t speak Hebrew. Then they either speak to me in English or we break out into an animated game of charades. And so I’ve gotten by. But I’m itching to learn the language so I can interact with people at the shuq and find ingredients in the store. On Sunday Beth and I started ulpan at the university. Although we missed the first class the instructor assured us we hadn’t missed anything important. But then she had long conversations with other students in what sounded to our untrained ears like Hebrew. Only later did we realize they were all speaking Russian; most of our class, it turns out, are recent Russian immigrants. She wrote the alef bet in script (which looks completely different from the print that you find on labels, street signs, and newspapers) on the board. And with that we were expected to know the script alef bet. The class proceeded in this fashion. She taught us the vowels – a series of dots and lines strategically placed around the letters to indicate what sounds they make – but told us they were none of our business. And here’s where it gets fun: the vowels in Hebrew are like training wheels. They come off. In most printed Hebrew they don’t include these helpful dots and dashes; you’re just supposed to know. After class I felt completely overwhelmed and confused. The other students seem far ahead of us, and I wasn’t sure that I had learned a single thing in three hours. And then something happened. Evan helped me study and made me sound out words and dialogues with him. Suddenly I was transported back to the first grade, sitting on the rug in my teacher’s lap sounding out my first picture book; the night that I went home and read to my dad for his birthday. Although I still probably couldn’t read through a children’s book in Hebrew the entire way home after studying I kept trying to read signs, just like I did when I first learned how to read. 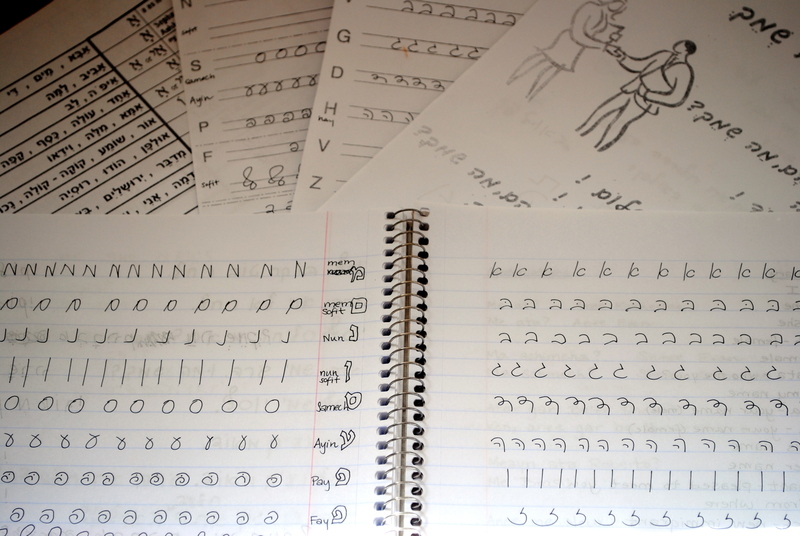 I have that same sense of childhood wonderment at being able to decipher the crazy hieroglyphics of a new language. I know it won’t last. Don’t get me wrong. I do not speak or read Hebrew. There was no magical osmosis. Even if I could read the words I wouldn’t understand them because I have zero vocabulary. I just got the vaguest hint that it is possible, and for now that’s enough. I like this entry. I’m interested in hearing more about this experience for you. 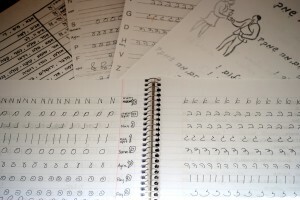 Learning a language at this age– especially Hebrew– seems very difficult. Do a lot of people there speak English? What are you going to be doing for work out there, missy? Anything come up yet? It’s hard I can tell you that much! 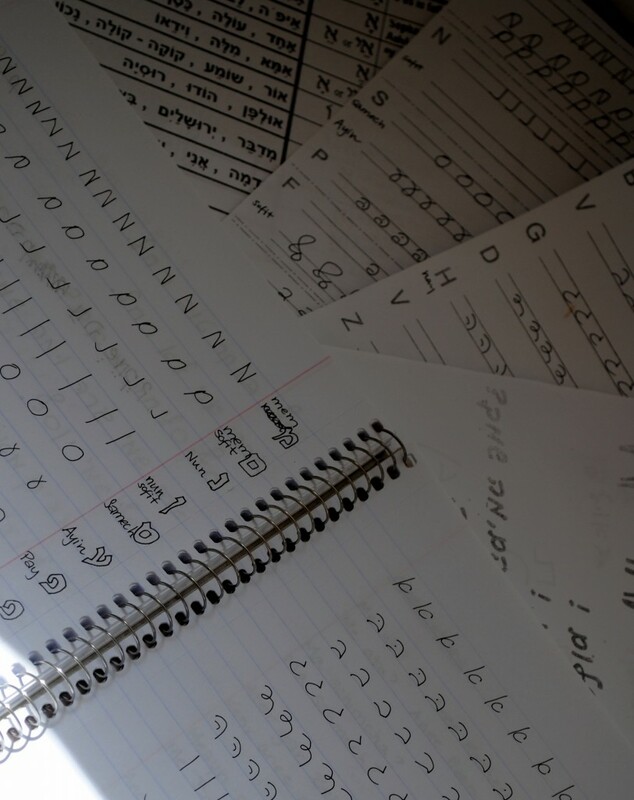 Hebrew has a different alphabet, different sounds, and on top of it all is read right to left. Being immersed helps of course, but it’s still incredibly challenging and it’s far more slow moving than I’d like. My Hebrew class meets twice a week for three hours each and the teacher speaks almost exclusively Hebrew. I didn’t think I was learning anything at first, but it turns out I’m picking up bits and pieces. The real challenge now is to study on my own and try to use the Hebrew that I know when the opportunities arise. And I’m writing! We can email and talk more but I have a bunch of freelance writing gigs starting that have been keeping me more than busy! Wow Katherine, once again I am in awe of you!!! Scott and I were supposed to go to our first hebrew class last night at the Village temple and then decided at the last minute we were just too tired. So….I am not at all proud of the fact that we bailed but am amazed at how you have embraced all that is Israel and are bound and determined to learn the language asap. You write so beautifully about all of your experiences!!! and have great results, buut I want to give you the easiest, and most cost effective way, that still gets results. infested with earr mites often shake their heads and scratch their ears. our homes and our environment. Make sure things around the house are clean and tidy. balanced skin. In doing so, it mmay likely take a significant component of the infection along with the skin development. To obtain the finest outcome, you have to submit down the wart. soaked and then delicately press out any kind of excess vinegar. Place the denched cotton ball on the wart. the cotton rolund undamaged, take advantage of a duct tape. The cotton ball can be left on the wart overnight, or in any way times when possible. presently there is little trouble of indirect poisoning. Mice afflicted by anticoagulants perish through hemorrhaging inside. do not couple their poisoning to the bait.